Eleanora dropping to Cleft Creek on Saturday. It’s Saturday night, before 8pm. I’m hunched below a top bunk of Cow Creek Hut, feeling very well fed and trying to scribble these notes by torchlight. Debbie and Eleonora are already trying to go to sleep. Debbie’s had the wood-burner going, and it’s toasty enough for me to have switched to a downstairs mattress, even though the mattresses don’t fit properly. We’re expecting rain overnight. A typical early winter’s evening after a fun-filled day. People: Debbie, Eleanora and me. 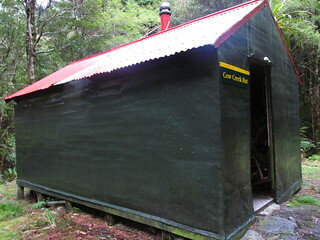 Huts visited: Blue Range Hut (1 night), Cow Creek Hut (1 night). Route: Kiriwhakapapa Road to Blue Range Hut on Friday night. 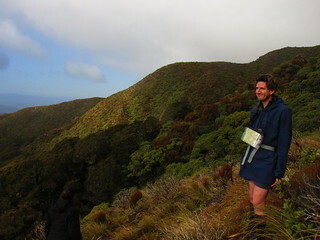 Then skim around Te Mara (along marked track) to .970. 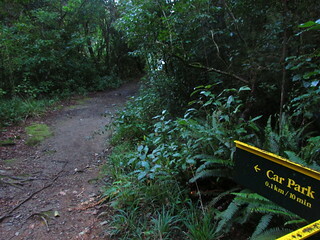 Navigate along ridge past .790 and .775 towards .655, and find a way down to Ruamahanga River track. Back to Cow Creek Hut via Cow Saddle for Saturday night. 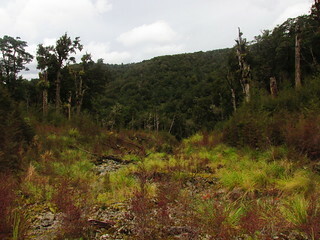 Out to Kiriwhakapapa Road via main track on Sunday. Also includes: A side trip up towards .1390 near Table Ridge above Cow Creek Hut on Sunday morning. Also see: The Friday and Saturday portion of this write-up make up part of a trip report published in the WTMC newsletter. The original idea had been to visit Table Ridge of the Tararuas and drop to Mid-King biv, but forecasts of strong gale-force winds swayed our intentions before leaving home. 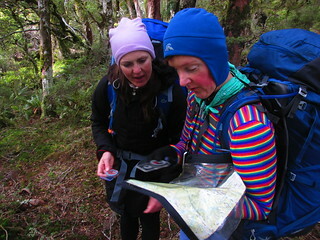 Instead, Debbie proposed a nav trip centred on Blue Range, which we hoped would be sheltered from the west. Blue Range Hut on Saturday morning. 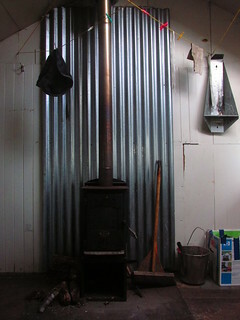 So it was that 24 hours ago, having arrived at the Kiriwhakapapa Shelter, Debbie, Eleonora and I strolled up the 600 vertical metres to Blue Range Hut with torches, arriving about two hours later. Blue Range Hut was empty, helpfully allowing plenty of space for the three of us. Debbie had water boiling this morning before Eleonora or myself had bothered to sit up. It’s great when someone does that. After some uneventful breakfasting and packing, Eleonora and Debbie left me behind to sweep out the hut before I also left at about 8am. After just one obsessive compulsive moment, needing to sprint back and check I’d bolted the door, I caught them on the slope on the marked track which skirts around the side of Te Mara: the high point of Blue Range. Despite the forecast for the highest parts of the Tararuas exposed to the west, we noticed barely any significant wind besides the occasional cold breeze in places where our downward-sloping ridge angled itself in certain ways. We even had sunshine, for a fairly pleasant walk. For me, it was a useful chance to practice some basic map and compass positioning skills along the track. We converged on the corner near .970 at around 9.15am. From here there’s a well walked (but unofficial) route straight to Cow Saddle, but this time we’d planned to continue approximately north-east. Something like .970 -> .790 -> .755 ->.655 -> ??? 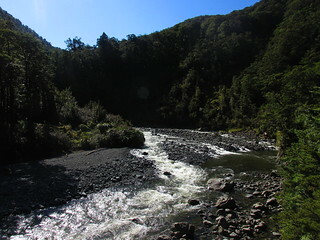 -> Ruamahanga River. The initial and informally marked trail evaporates beyond .970, unless you’re aiming for Cow Saddle which we weren’t. Debbie and I each took a compass bearing, called out numbers, then argued about numbers because we use different systems. Eventually we waved our non-numerical arms around until they were aiming in roughly the same direction. It seemed to work. 810m, as we tried to decide on a right turn. Eleonora was new to compass use, and I showed how to take a bearing from a map and translate it to a direction in the real world. Several minutes later after more confusion with communicating bearing numbers, Debbie re-educated Eleonora with the more aesthetically pleasing method which has the red pointy end aimed towards a giant letter ‘N’ instead of the real magnetic north. Then we waved arms in various directions again, and followed them, which also seemed to work because somehow we found ourselves at .790. It contained some dirt and at least two trees. As an aside it’s pertinent to note that Lyle Brotherton, author of the Collins Ultimate Navigation Manual and lauded by his reviewers as the greatest global authority on navigation, states (p96-97) that when using a compass, one should adopt “the brace position” on one knee, as standard practice for the purpose of “signaling to others that you’re working and should be left to get on with it”. None of us were navigating very well according to this. 500 metres north of .755 we stopped for a break, and also had to make a choice: Either aim slightly west of north and straight for the river, or continue to .655 and search for a way down from there. One might often use a coin to make a decision in these situations, but New Zealand’s cashless society had robbed us of our coins. Debbie had a credit card, however, and as it tumbled and twirled through the airborne fabric of our fates, I tried to remember which direction we had associated with each side. Eventually, landing front-side up, Debbie declared the decision had been made! Aiming straight down is harder than it looks. We’d aim straight down. After all, it was by now 11.20am. Lunch for all at the Ruamahanga River! Approaching the 500m contour, we became caught in a steep drop-off of a valley. I guess this is what happens when you don’t use the brace position to operate a compass. After some backtracking, sidling, then motoring forward and downwards, it was easily corrected and we walked into an orange triangle above the river. Lunch time! A dry river bed that’s not so dry. From here, with the intended navigation done, our plan was to follow the marked track back to Cow Saddle, then down to Cow Creek Hut. It’s all orange triangles, but we still managed to become confused in a way that wouldn’t have been possible for anyone simply following triangles. Some simple observation revealed that the string of triangles we’d found didn’t resemble the track marked on any of our maps at all. Shortly after crossing Cleft Creek, they led us inland into an area which LINZ renders as an isolated dry riverbed rather than the very obvious waterway that it was, then took us most of its length, rejoining the Cow Saddle track about 200 metres north of the saddle itself. The eventual trip down Cow Creek took us a little under an hour, via another string of markers which seem to have been redirected since I was last here. 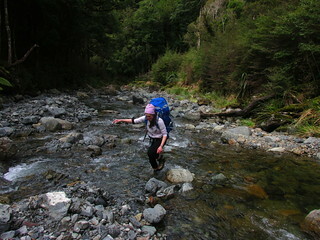 Finally reaching the Waingawa (still in low flow for now), I elected to stomp straight across, direct to Cow Creek Hut on the far side by around 4pm. 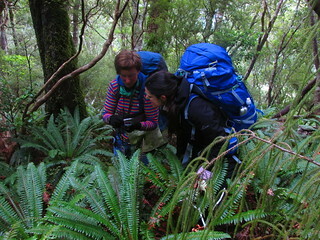 Debbie and Eleonora went to find the high-water route around to the enormous bridge, taking about another 15 minutes. It was good timing, too, as rain was beginning to fall. Nobody was home, and once again we had the hut to ourselves. In fact, nobody had even written in the book since late June. Dinner’s worked really well for all of taste, food value, and not sticking to everything when I washed dishes afterwards. Anyway, it’s Saturday night, before 8pm, I’m sitting in Cow Creek Hut, feeling very well fed and trying to scribble these notes by torchlight. Debbie and Eleonora are already … actually, never mind. We wake again on Sunday morning, some time before 7. Once again Debbie has water boiling, and the three of us gradually arise. It’s been raining overnight, and although the sun’s now out the Waingawa River is up compared with when I stomped across it yesterday. Maybe it’d still be possible to ford, but it’d be more necessary to choose the right spot. 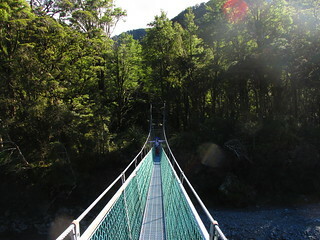 Fortunately that shouldn’t be an issue anyway, thanks to the giant suspension bridge next to Cow Creek Hut which crosses the Waingawa. We could go straight back to the car this morning, but a certain person whose name starts with ‘D’ has proposed another idea, which is to climb up towards Table Ridge, essentially to and prove it’s still there, then come straight back down and resume walking out. Trust a trip leader to never let a rearrangement of plans to get in the way of some quantitative hill climbing. I’m reminded of my few there-and-back-again mountaineering experiences. In any case, I haven’t been up the unofficial off-track route to Table Ridge before. When it’s clear that the others are both keen it doesn’t take much convincing for me to join them and red-line another part of the Tararuas. We drop some of the less necessary ballast in the hut, and at 8am we assume the start of our climb, which begins with about 200 metres of climbing straight up the start of the “sidle” track towards Arete Forks. After about 30 minutes I’m staring at my map and compass and thinking we have about 50 metres of further climbing before it’ll be time to leave this nicely marked track and continue up the spur. I call this to Debbie up ahead, who smirks as she shouts that it’ll be sooner than that. Within seconds I realise she’s standing in front of a giant sign-post, which points further up the hill to Table Ridge. Furthermore, several trees beyond are at least two bright orange triangles. I know it’s a well walked route, but this is a glaringly conspicuous track for something which DOC doesn’t officially acknowledge. 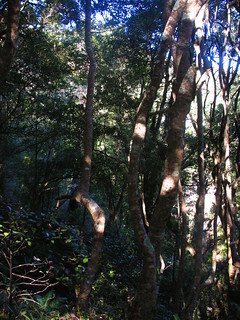 As well as being obvious under the trees, with periodic miscellaneous markers of various sorts from tape to Forest Service white rectangles, the climb is as constant as any regular climb in the Tararuas. Consistently graded might describe it. 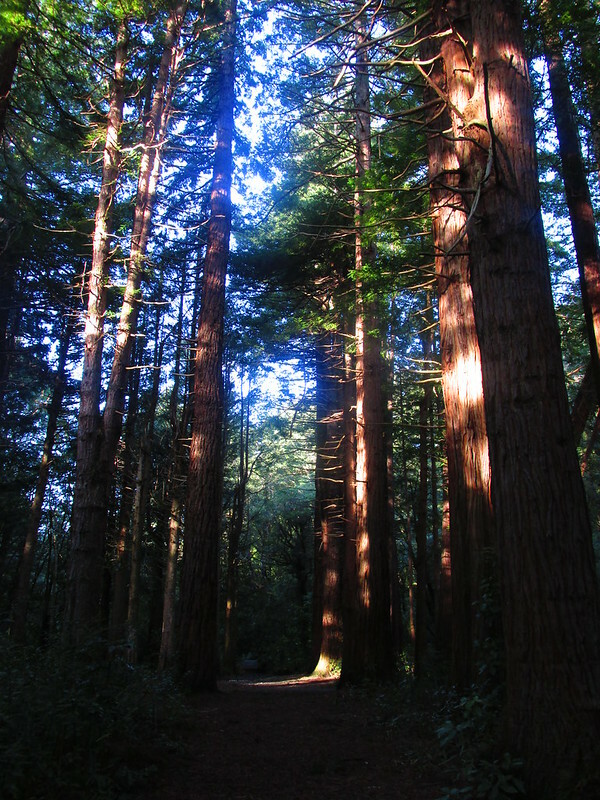 Finally, at 9.25am, we reach the edge of the trees, marked by three stacked orange triangles, and wander into a tussock and leatherwood landscape. Despite forecasts of wind, it’s not clearly evident at this location, either because we’re sheltered or because it’s already come and gone. Evidence of any kind of ground trail is also lacking from here up. For a few minutes we just continue to climb, noting the presence of a cairn of rocks that’s been built near to where we came out. Briefly gazing around before we had to return. What have we discovered? Firstly, there’s such a thing as up. Secondly, we don’t really have time to comfortably go any further and reach the nearby high-point of .1390, which is still about 500 metres away horizontally and 200 metres vertically. Instead we glance across to Blue Range, where I note the high point of Te Mara and trace our route of yesterday along the visible ridge-lines. 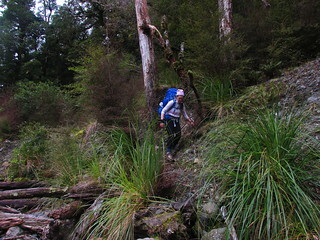 Then we turn, stumble down the slippery rocks and tussock, and back into the trees. The descent is uneventful. I reach Cow Creek Hut at exactly 10.42am and 48 seconds, and as I await the others there’s an opportunity to sit back and relax. With time to burn, we laze around at Cow Creek for nearly an hour. On the side, if anyone knows Charlie and Chelsea of Masterton, Chelsea seems to have left a bright orange head-torch at Cow Creek. It has “CHELS” written on the strap. It was found down the edge of a mattress, but we leave it on top of the hut book cabinet as we close the door. It’s 11.30am, and time to go. 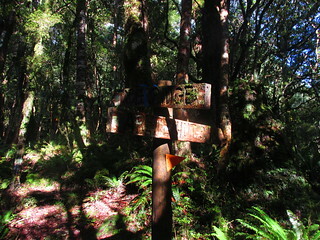 After crossing the large bridge over the Waingawa, the main track from Cow Creek Hut follows the true left of the river for a short distance. On occasions it’s easier to walk at river level than to try and straddle some of the slip-faces which triangles annotate a few metres above us, but we need to keep a close eye on the markers with the knowledge that at some point they’ll be shooting straight up the hillside. We reach that point at 12pm, roughly half an hour after leaving the hut, having walked at a fairly leisurely pace. From this point it’d be fair to say that it’s most definitely up, and the gradient is very consistent. It takes a little over an hour for the three of us to climb the 450 metres. We’ve now reached a familiar sight from yesteday, being the sign on .960 which we left yesterday morning, to follow the un-tracked ridge. From here, we’re re-tracing our steps back to the car. Debbie’s developed a nagging concern about possibly having left a window open at Blue Range Hut yesterday morning, obscured behind one of the standing mattresses. I’m feeling quite good, so I agree to run ahead and check, with the idea that nobody will go beyond the track junction south of the hut until we’ve met up again. I reach the hut at about 2.30pm to find the window closed, and that a couple of parties were crammed in overnight, and (thankfully) that nobody’s taken it upon themselves to write a lengthy rant about us leaving a window open. Thanks, guys! DOC’s ever made for a 100 metre stretch. The others are arriving just as I return to the main track. We find a relatively flat area, and sit for a short and late lunch and lazy rest break. In familiar territory and good conditions, we agree to drop back to the carpark at our own pace, which for me lasts for about an hour of descent between 3pm and 4pm before it flattens out. It’s here that I meet the first people from outside our party during the entire weekend. They’re walking around the short loop track at the base. We wave to each other, and wanting to rinse some mud from my boots I get a glance as I avoid the bridge in favour of walking straight through the creek. This is only a few minutes from the road, after all, and the last few minutes are a flat, wide track. It’s 4pm, the place is quiet, and I sit back to wait. 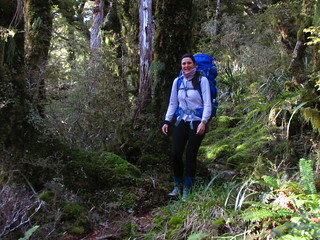 This entry was posted in tramping and tagged tararuas, tramping, wellington tramping and mountaineering club. Bookmark the permalink.